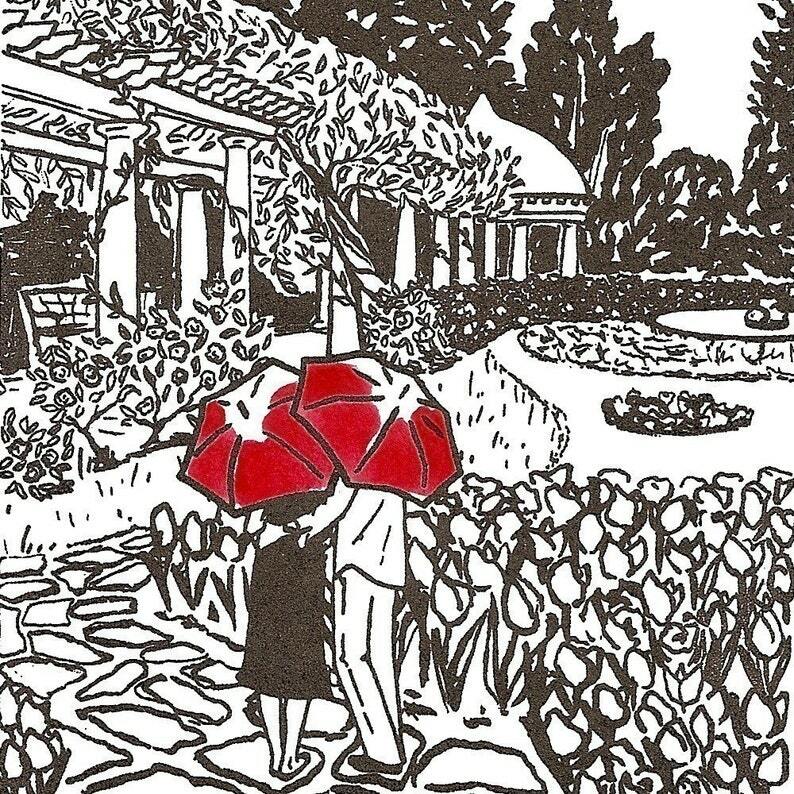 This limited edition gocco screenprint captures a couple taking a moment to enjoy the Italian Garden in Richmond, Virginia's Maymont Park. Richmond is a very cool city, and I especially like Maymont Park, which I went to for the first time a few weeks ago. I just love its mix of beautiful gardens, large stretches of pristine grass to have a lovely picnic on, koi ponds, romantic gazebos, pygmy goats, buffalo, one-eyed owls, and bears. Way to go Richmond: you officially get my vote for having the coolest ever garden/park/petting zoo/rescued bird sanctuary/bear home. Awesome. The black is hand printed from an original illustration, and the red umbrellas are painted with watercolor (please allow for some minor variations since each one is individually printed and painted). It is part of an edition of 250. The image size is approximately 3.5 x 5.5 inches on white Stonehenge paper. The total paper size is approximately 9 x 6 inches. I know the paper size is unusual, but never fear, you don't need a custom framing job, an 8x10 inch frame with a standard white 5x7 mat looks great! I usually buy mine from Michael's craft stores, where they sell simple black frames with the mat already included (these are the frames my prints are pictured in). Each print is signed and numbered. Edition number subject to availability.